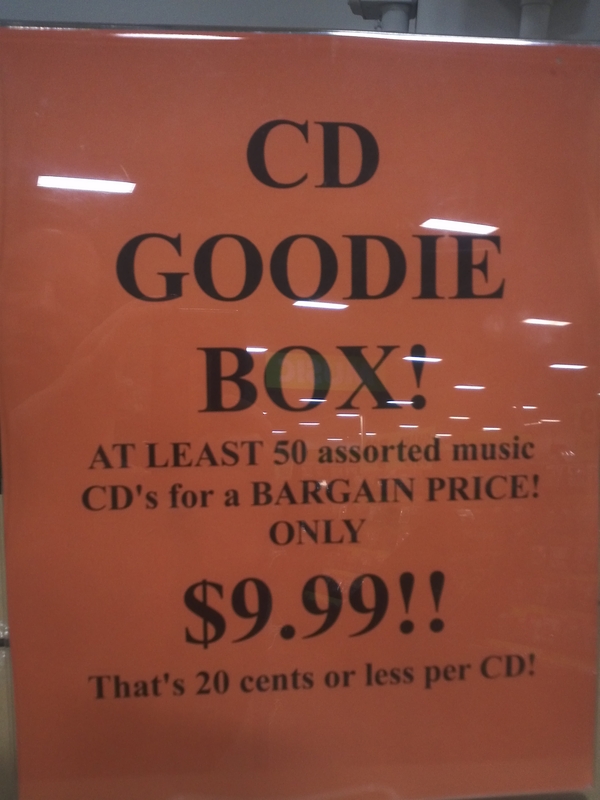 I know “CD GOODIE BOX” AND “$9.99! !” are the most important messages on this sign, but that’s no reason to include errors in the small print. Again, I was at Tradesmart, and again, I found an error in its advertising strategies. This particular error happens frequently: using an apostrophe to form a plural. In this case, the problem is the word “CD’s.” Remember, apostrophes are used to form the possessive, so if we were talking about a CD’s psychological problems, then the apostrophe would be absolutely necessary. However, if we are talking about one CD that joins its two other CD buddies to discuss their psychological issues, the new group would be CDs — with no apostrophe. 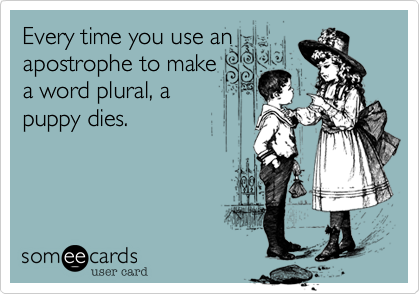 My feelings about apostrophes used to create plurals: click here. I had the same argument with a commanding officer at Cadets, when it came to “the NCO’s room”. I think people get too confused with the double life of the apostrophe. While used in one respect as the possessive, it’s use for replacement of missing letters in contractions, as in doesn’t or don’t, causes the confusion with abbreviations. I agree, Tony. I think apostrophes have too many jobs for everyone to keep straight. It’s our job to advocate for apostrophes. 🙂 And I’m impressed (and delighted) to hear about your correcting your commanding officer at Cadets; it just goes to show that grammar can be discussed anywhere, anytime! Pingback: Apostrophes and Plurals: Once in a Great While « I Started Late and Forgot the Dog.